After spending four years as a USAF radar technician, I do not recall ever hearing the term 'radician,' which, according to this article and a few obscure sources on the Internet, is the name given to a radar technician. OK, so I'm a former radician, but I digress. The DEW Line, or Distant Early Warning Line, was a string of radar installations running across the U.S., Canada, and Greenland, just above the Arctic Circle (66½° latitude) and just south of the 70th parallel. It was established to protect against potential attacks and/or surveillance by aircraft and/or missiles from the U.S.S.R. (remember them?). Although the radar systems were the purview of the U.S. Air Force, most of the staff technicians were civilians with former military radar experience. This article is basically a recruiting effort to convince men to sign on for a year or more of duty in frozen wastelands where the sun never shines for months out of the year. Pay was pretty good - up to $21k in 1964 ($164k in 2017 dollars per the BLS CPI calculator). The DEW system was integrated as part of the U.S.-Canada North Warning System (NWS) in 1988. You might be interested to know that Oscar-winning (just kidding) movie "The Deadly Mantis" featured DEW Line radars in it. Also, around 1984, the Canadian rock group Rush recorded a song titled "Distant Early Warning," with the DEW system in mind. Map showing the various stations of the Distant Early Warning (DEW) Line along with the six main "Data Center" stations. As an official guest of the U.S. Air Force, we saw radar and communications technicians service, maintain, and operate all types of DEW Line equipment. The mission of the Distant Early Warning (DEW) Line is to detect, identify, and report to NORAD commanders any aircraft penetrating our northern defense line. Some 33 individual radar sites, spaced in an arc directly above the Arctic Circle, extend 3,290 miles across Alaska, Canada, and Greenland. It was constructed by Western Electric Company and turned over to the U.S. Air Force in 1957. Since then it has been operated and maintained by the Federal Electric Corp. (Division of ITT) under contract with the Air Force. It is basically contractor-operated with limited military participation. 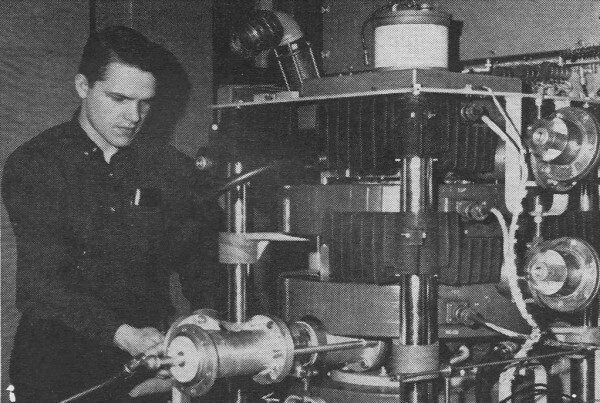 Joseph Doucette shown at the order-wire rack of the ionospheric scatter, rearward communications system at "Cam-Main" site. He has worked 4 1/2 years in the Arctic on all types of DEW Line equipment. Formerly Technical Instructor at the Domestic Training Center, Streator, Ill. and Training Supervisor on the DEW Line, he is now Section Installation Supervisor on new communications system for the DEW line. Electronics as a vocation - particularly in the areas of service, maintenance, or operation - certainly has its share of disadvantages, like any other profession. But those professionally trained and willing to accept employment in a land of snow, ice, and semi-darkness find loneliness the only demoralizing factor. All other disadvantages seem to disappear. Even the fact that temperatures may drop to -65° seems relatively unimportant. To be physically removed from family and friends for long periods of time is an unbearable loneliness to many. Yet the 250 "radicians" (radar technicians) at the DEW Line sites find the pay exceptionally good and the work challenging. Tom Sullivan, Communications Supervisor at the Barter Island site in Alaska, summed it up very neatly: "Most of my work as a broadcast engineer in the States became routine - nothing new. Now I have all the opportunities to get practical experience with new systems including tropospheric and ionospheric scatter communications." He did admit, though, that money was also a motivating factor. The DEW Line has 33 sites north of the Arctic Circle, all of them having similar pulsed radar search equipment. Since the DEW Line's main purpose is to detect all aircraft entering our northern defense area, the importance of the radar equipment becomes apparent. Each site has dual equipment just in case of failure in one of the units. A radician is always at the control console viewing the radar screen. This is the most important job of all. Men work in pairs on four-hour shifts. While one is operating the control console the other is doing maintenance work on the standby equipment. A large number of planes are tracked during a month across the entire DEW Line which does, in a way, break up the monotony. Every plane planning to cross this defense area must file a flight plan. Additionally, each plane must cross the DEW Identification Zone within prescribed correlation limits (time and distance) which leaves very little room for error. Larry Davis of Klamath Falls, Oregon, obtained his radio-relay and microwave experience at USMC school. He is one of eight technicians trained to man the "Bar" terminal of the "Bar"-Fort Yukon system. 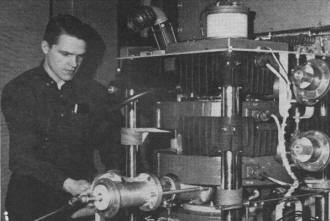 He is shown checking a spare klystron tube made by Eimac Corp. It is a standby unit placed in front of transmitter preparatory to quick insertion in case of any failure of the klystron in the main transmitter. Communications, of course, playa vital role and although each of the 33 sites is connected in the system, there are six main stations referred to as "Data Centers." It is at these centers that all information on flight interception is analyzed, plotted, coded, and passed on to our North American Air Defense Command. Ionospheric scatter systems, at v.h.f. 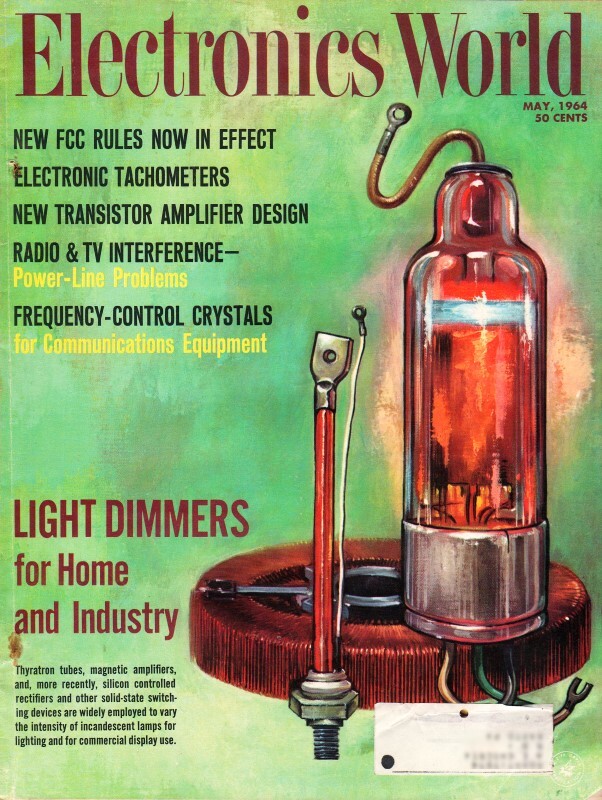 frequencies, were being used for longer transmissions. These were employed from the "Fox" site to Bird in Manitoba, Canada; from "Cam" site to Fort Nelson in British Columbia: from "Pin" site to Waterways in Alberta; and from "Bar" site to Fort Nelson, Ft. Yukon and to Anchorage, Alaska. In addition to the maintenance, servicing, and operation of these systems, radicians are called upon to perform similar functions on pulse system navigational aids, aircraft guidance equipment, weather bases, and emergency maintenance. The "friend-or-foe" identification system, although it is serviced and maintained by contract technicians, is operated by the military. In most of these areas, the radicians may be called upon to plan, install, operate, and maintain or instruct other personnel in taking over operation and upkeep. They may even be asked to climb ice-covered masts in order to adjust the communications antennas. Obviously, the sort of individual who can handle such responsibilities is not a carefree person just seeking excitement. A taste for adventure is an asset, of course, but most important is technical knowledge and an ability to work alone with a sense of responsibility. 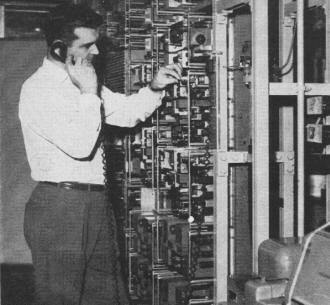 To obtain such men and to train them for the work to be done is the responsibility of Federal Electric Corp., a division of International Telephone Telegraph Corporation. FEC is basically a service organization and its contract (which runs to about $25 million this year) with the Air Force is to supply, maintain, and operate all facilities on the DEW Line. Most FEC technicians have had previous electronic training in either the military or some area of industry, or highly specialized vocational schooling. Communications specialists are in great demand and any technician with a solid background in this area is a choice applicant. Formal education at a college or technical training institute is most desirable. A background confined to only training or experience in consumer equipment service would not be generally adequate. Math seems to be desirable. Courses in algebra, trigonometry, geometry, and even calculus, condition one's mind to think along technical lines. 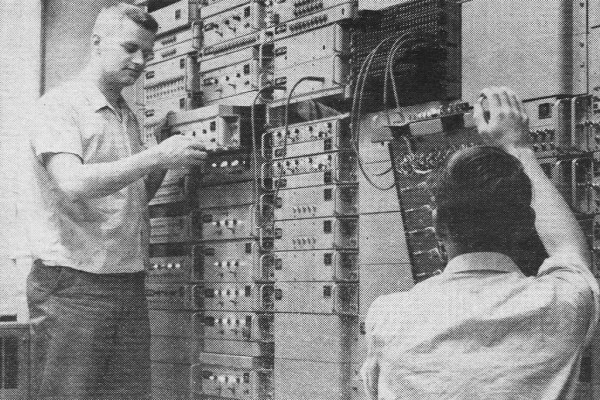 Brian Marshall (left) and John Sheridan installing new transistorized frequency stacking multiplex system built by Lenkurt. Brian Marshall is lead electronics technician at the "Cam" site, with previous communications training with the RCAF. John Sheridan is a project installer and has been on the DEW Line only five months. He has had previous communications training with Marconi Wireless Telegraph, England. The DEW Line base "Dye 1" located on the east coast of Greenland. The four billboard-like structures are the forward-scatter antennas that are employed for communications. Within the dome at the center is radar antenna. Although technical ability is most important, all applicants are carefully screened with regards to temperament and outlook. Liking and getting along with people is important. These men not only have to work together as teams, but actually live together months at a time. Extremists in any form are undesirable. Every technician considered for DEW Line service must be physically and mentally sound and extensive tests are given prior to acceptance. Age and marital status are relatively unimportant. The average age of DEW Line technicians is near 31, and almost 70 percent are married. Obviously, the single person is apt to have fewer family ties and outside worries, yet the married man has proven somewhat more reliable. Most of the responsible positions are handled by married men. Surprisingly, most single men drop out after one or two terms, while some of the married men have been on the Line since its inception. When one considers the importance of the DEW Line, it is not difficult to understand why extensive precautions are taken in selecting the right men. After passing all tests and prior to being sent to the DEW Line, each prospective technician must attend a training course at the FEC Training Base in Streator, Illinois. Identical equipment is used and all prospective employees must learn maintenance, servicing, theory, and operation of the various types of equipment. All technicians must sign a contract for eighteen months and additional terms are based on twelve-month contracts. Salaries vary - from $10,000 to $21,000 annually, depending on the length of service and responsibilities. All transportation from the point of recruitment, food, and housing are supplied free. Working conditions are beyond expectations. Each base is well heated and such facilities as automatic washers and dryers are supplied. Each technician has a room of his own. Technicians must work nine hours a day, six days a week, which leaves sufficient time for hobby activities. In addition to each base showing three movies a week, technicians find time to indulge in such hobbies as photography, painting, hi-fi listening, and ham radio.